Kingspan is a rigid, general purpose insulation board suitable for a wide range of uses, and available in a number of different grades. 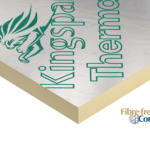 The Kingspan Kooltherm K-range comprises the thinnest commonly used insulation products for any specific U-value. With a fibre-free rigid thermoset phenolic core, and a thermal conductivity of 0.018 – 0.023 W/m·K, these are the most thermally efficient insulation products commonly used. Kingspan OPTIM-R is an optimum performance rigid vacuum insulation panel (VIP) with a declared thermal conductivity of just 0.007 W/m·K, providing you with an insulating performance that is up to five times better than commonly used insulation materials. With a fibre-free rigid thermoset PIR insulation core, and a thermal conductivity of 0.022 – 0.026 W/m·K, Kingspan Therma range products are among the more thermally efficient insulation products commonly used. Kingspan Styrozone is a fibre-free rigid extruded polystyrene insulation (XPS) that has the necessary compressive strength to make it the product of choice for specialist applications such as heavy-duty flooring, car park decks and inverted roofs. Kingspan can comply with the thermal requirements of building regulations if used correctly, so it will fully meet the needs of almost any building professionals. It’s an extremely versatile material, suitable for use with floor, wall and roof installations: whatever project you’re working on, Kingspan will work effectively, it is also lightweight and easy to cut.